On weekends my favourite thing to do is go for brunch. To me, it is like an event. I want to go somewhere with delicious menu items, whether it’s a signature dish or a classic, good coffee, maybe a mimosa and of course my friends. But going for brunch every week is not always possible, but that doesn’t mean I will settle for a bowl of cereal. When I’m not brunching on a patio, I still make myself a brunch worthy meal. One of my favourite breakfast items on my home menu are breakfast toasts. You can grabs whatever is in your fridge and top it with a poached egg, and voila! Breakfast is served. Put bread on a cookie sheet and drizzle with olive oil. Bake for 10 minutes until toasted. Rub the toast with the clove of garlic while hot. In a frying pan on medium heat, add the cherry tomatoes with a drizzle of olive oil. Add a sprinkle of salt and pepper and fry until tomatoes soften. Take off heat. Don’t overcook or they will turn into mush. Poach egg in boiling water with 1 tsp. of vinegar for 3 minutes. Remove from water and put on a paper towel to absorb the water. In a blender, add a handful of parsley and basil. Add 1/4c. olive oil and a pinch of salt. Blend into a puree. 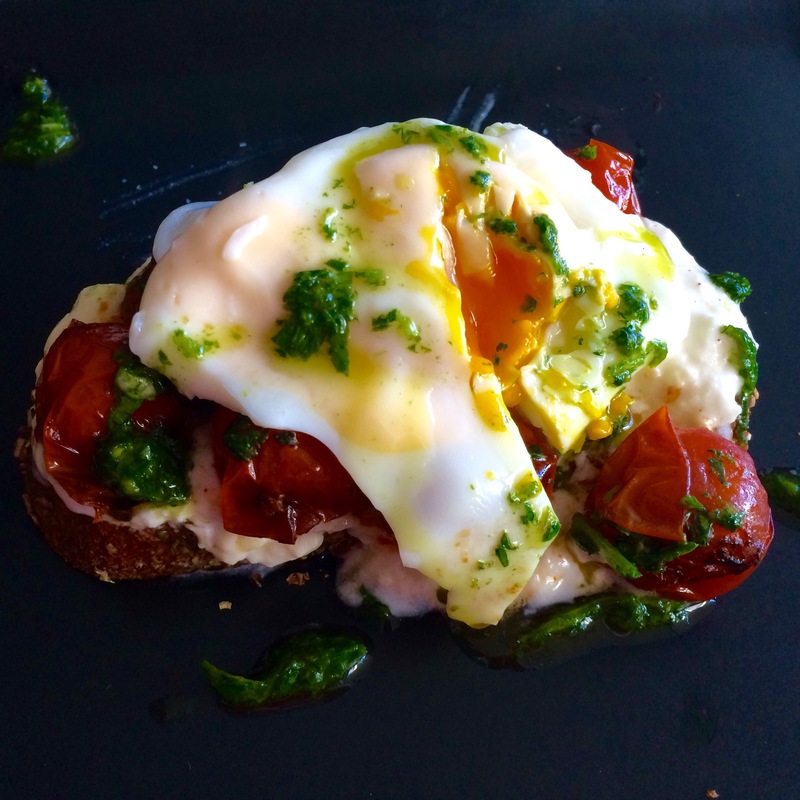 Spoon burrata on the toast. Sprinkle with salt and pepper. Top with cherry tomatoes. Place the poached egg on top and drizzle the basil-parsley oil over the egg.